Remote handling is the linking agent that connects all aspects of a nuclear plant. It removes all human interfaces from the previously needed manual labor necessary for a functioning plant. The physical strenuous work necessary to a working nuclear plant is filled with remote handled autonomous robotic system that is teachable by human programmers. Remote Handling Systems include a large and diverse series of servo manipulators, automated conveyor belts, and an operator based processing computer. 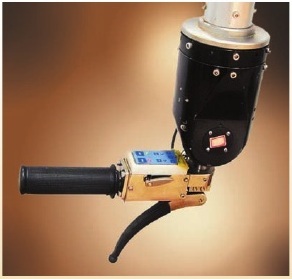 A Servo Manipulator is a series of robotic arms that are controlled by a computer operating program or a handheld human operated device. The generic servo manipulators contain two main arms: the master arm and the slave arm. The slave and master arms are not mechanically linked together allowing them to move independent of the other. 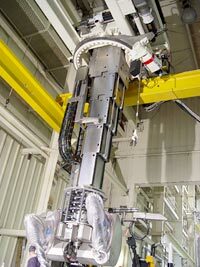 The master arm is the portion of the servo manipulator that humans interact with within the safety of the control room. 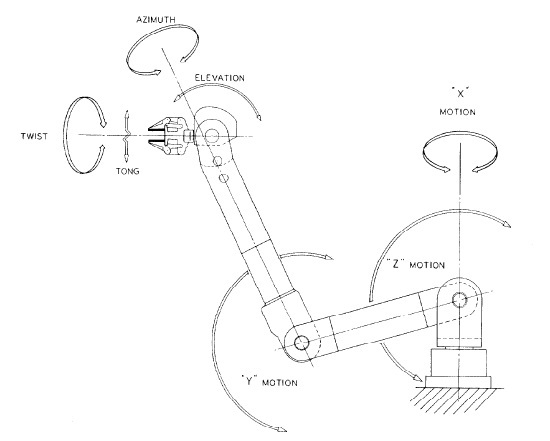 A master arm is designed to sense as well as control the necessary amounts of force and torque needed for the servo manipulator to complete a task. The slave arm is designed to complete the gripping, moving, and lifting tasks of the servo manipulator. The slave arm is built with light weight radiation proof materials to assure the longevity and efficiency of the servo manipulator. The slave arm has six degrees of freedom that allows the servo manipulator to move in any direction needed to complete a task. The main component to a slave arm is its gripper, which are two parallel jaws that remain parallel at all times to maximize gripping ability. The contacting surfaces of the jaws are generally made out of rubber to provide the maximum amount of friction needed to grip the products being manipulated. The jaws of the gripper are readily replaceable to match the objects being lifted. Typical nuclear facilities use large remote handled overhead cranes to do the heavy and strenuous lifting needed in the factory. The Gantry Company have been creating PaR System cranes for 40 years with robotic cranes including the M3000, M6000, TR®4350 and TR®6350. These cranes have the ability to withstand up to 10to^9 rads of radiation. The Overhead cranes are able to be either remote controlled or computer programmed which removes the need of human interaction in radioactively hazardous areas of the facility. The control system of the servo manipulator is digitally controlled which allows for a highly flexible apparatus that has long term stability. The control system is made up of a computer generated operator interface and a coordination computer that communicates with both arms of the servo manipulator to operate the joint controllers of the master arm. The second aspect of remote handling is a series of fully automated conveyor belts used to transfer products from one area to another. After the products are finished at each portion of our closed system they are transferred from location to location through methods of conveyor belts. The conveyor belts act as the highways connecting our entire plant together. Pallet Conveyors are the main type of automated conveyor system that our remote handling process uses. These conveyors have the ability to transport very large and cumbersome objects throughout the facility. 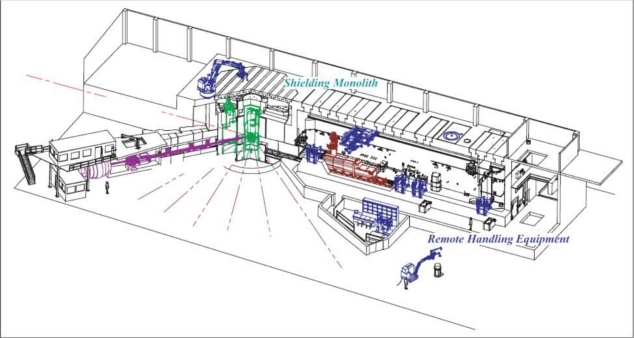 The automated conveyor system removes all human interaction from the process of transferring the radioactive products.